Ethnolinguistic map of the precolonial Andaman Islands. The languages with prefixes (which mean "language") are Great Andamanese. The Great Andamanese languages are an extinct language family once spoken by the Great Andamanese peoples of the Andaman Islands (India), in the Indian Ocean. The last fluent speaker, of what may have been a creole based on Aka-Jeru, died in 2009. By the late 18th century, when the British first settled on the Andaman islands, there were an estimated 5,000 Great Andamanese living on Great Andaman and surrounding islands, comprising 10 distinct tribes with distinct but closely related languages. From the 1860s onwards, the setting up of a permanent British penal colony and the subsequent arrival of immigrant settlers and indentured labourers, mainly from the Indian subcontinent greatly reduced their numbers, to a low of 19 individuals in 1961. Since then their numbers have rebounded somewhat, reaching 52 by 2010. However, by 1994 seven of the ten tribes were already extinct, and divisions among the surviving tribes (Jeru, Bo and Cari) had effectively ceased to exist due to intermarriage and resettlement to a much smaller territory on Strait Island. Some of them also intermarried with Karen (Burmese) and Indian settlers. Hindi increasingly serves as their primary language, and is the only language for around half of them. The last known speaker of the Bo language died in 2010 at age 85. About half of the population now speak what may be considered a new language (a kind of mixed or koine language) of the Great Andamanese family, based mainly on Aka-Jeru. This modified version has been called "Present Great Andamanese" by some scholars, but also may be referred to simply as "Jero" or "Great Andamanese". A cushion or sponge is ot-yop "round-soft", from the prefix attached to words relating to the head or heart. A cane is ôto-yop, "pliable", from a prefix for long things. A stick or pencil is aka-yop, "pointed", from the tongue prefix. A fallen tree is ar-yop, "rotten", from the prefix for limbs or upright things. Body parts are inalienably possessed, requiring a possessive adjective prefix to complete them, so one cannot say "head" alone, but only "my, or his, or your, etc. head". 'This' and 'that' are distinguished as k- and t-. Judging from the available sources, the Andamanese languages have only two cardinal numbers — one and two — and their entire numerical lexicon is one, two, one more, some more, and all. Joseph Greenberg proposed that Great Andamanese is related to western Papuan languages as members of a larger phylum he called Indo-Pacific, but this is not generally accepted by other linguists. Stephen Wurm states that the lexical similarities between Great Andamanese and the West Papuan and certain languages of Timor "are quite striking and amount to virtual formal identity [...] in a number of instances", but considers this to be due to a linguistic substratum rather than a direct relationship. The following poem in Aka-Bea was written by a chief, Jambu, after he was freed from a six-month jail term for manslaughter. leaning on the bamboo spear. Note, however, that, as seems to be typical of Andamanese poetry, the words and sentence structure have been somewhat abbreviated or inverted in order to obtain the desired rhythmical effect. Kuro-t'on-mik-a Mom Mirit-la, Bilik l'ôkô-ema-t, peakar at-lo top-chike at laiche Lech-lin a, kotik a ôko-kodak-chine at-lo Karat-tatak-emi-in. "Kuro-t'on-mik-in Mr. Pigeon, God ?-slep-t, wood fire-with stealing-was fire the.late Lech-to he, then he ?-fire-make-did fire-with Karat-tatak-emi-at." Mr. Pigeon stole a firebrand at Kuro-t'on-mika, while God was sleeping. He gave the brand to the late Lech, who then made fires at Karat-tatak-emi. ↑ Hammarström, Harald; Forkel, Robert; Haspelmath, Martin; Bank, Sebastian, eds. (2016). "Great Andamanese". Glottolog 2.7. Jena: Max Planck Institute for the Science of Human History. ↑ A. N. Sharma (2003), Tribal Development in the Andaman Islands, page 75. Sarup & Sons, New Delhi. ↑ Anosh Malekar, "The case for a linguisitic survey," Infochange Media, August 1, 2011. ↑ Abbi, Anvita, Bidisha Som and Alok Das. 2007. "Where Have All The Speakers Gone? A Sociolinguistic Study of the Great Andamanese." Indian Linguistics, 68.3-4: 325-343. 1 2 Abbi, Anvita (2006). 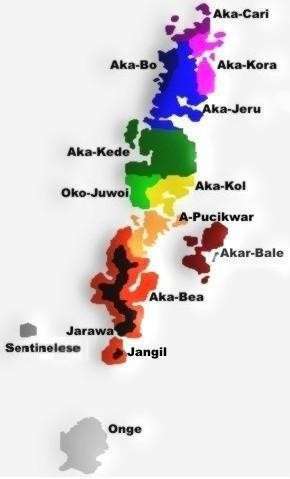 Endangered Languages of the Andaman Islands. Germany: Lincom GmbH. 1 2 3 4 Temple, Richard C. (1902). A Grammar of the Andamanese Languages, being Chapter IV of Part I of the Census Report on the Andaman and Nicobar Islands. Superintendent's Printing Press: Port Blair. 1 2 Greenberg, Joseph (1971). "The Indo-Pacific hypothesis." Current trends in linguistics vol. 8, ed. by Thomas A. Sebeok, 807.71. The Hague: Mouton. ↑ Manoharan, S. (1983). "Subgrouping Andamanese group of languages." International Journal of Dravidian Linguistics XII(1): 82-95. ↑ Wurm, S.A. (1977). New Guinea Area Languages and Language Study, Volume 1: Papuan Languages and the New Guinea Linguistic Scene. Pacific Linguistics, Research School of Pacific and Asian Studies, Australian National University, Canberra. ↑ A. N. Sharma (2003), Tribal Development in the Andaman Islands, page 62. Sarup & Sons, New Delhi. Yadav, Yogendra. 1985. "Great Andamanese: a preliminary study." Pacific Linguistics, Series A, No. 67: 185-214. Canberra: The Australian National University. Families with more than 30 languages are in bold. Families in italics have no living members.